Ready to head off and do some scuba diving in Cozumel? We have a Cozumel map for you. In fact, we have several maps for you to help you plan that scuba diving vacation. Cozumel is one my favorite places to go diving. In fact, it makes our list of the best places to scuba in the Caribbean. And Horseshoe, one of the dive sites off of Cozumel, makes our list of top dives too. We also love traveling around the island and checking out some beach bars when we are not diving. While a map is good to have, it is not necessary for this since there is only one road cirlcing the island. Pretty hard to get lost on this outing. Way back we heard that Donald Trump is considering putting a casino on the undeveloped east side of the island (you'll see pretty much nothing there on the maps now). It hasn't happened so that one is dead. Wouldn't be surprised if it eventually does get developed. Here's hoping it doesn't happen. 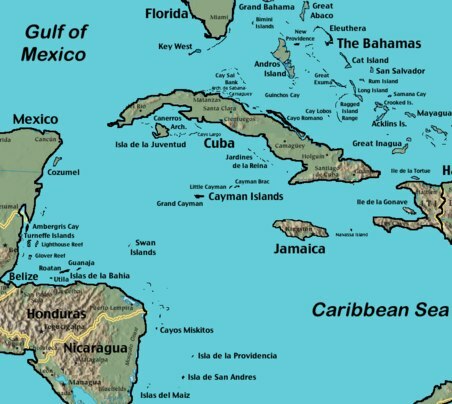 First we'll show you some maps to pinpoint where Cozumel is located in relation to the mainland of Mexico and the Caribbean. Then we'll have an island map of Cozumel followed by some fun interactive maps. Cozumel is located off the east side of the Yucatan Peninsula. This map shows the major sites on Cozumel including ruins (though none are impressive IMO - at least compared to the fantastic ruins located on the mainland). This is the fun interactive map of Cozumel I talked about before. Just click on the arrows to zoom in on the area you want to see (or zoom out to get a larger picture). The place names will come up as you zoom in. Try it, it's alot of fun. 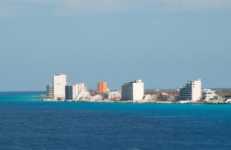 I zoomed in on downtown Cozumel and the cruise ship terminal here to make it easier for you. The ferry from the mainland lands just to the right of the cruise ship pier on this map. Just scroll over a bit pn the map and you will see it. 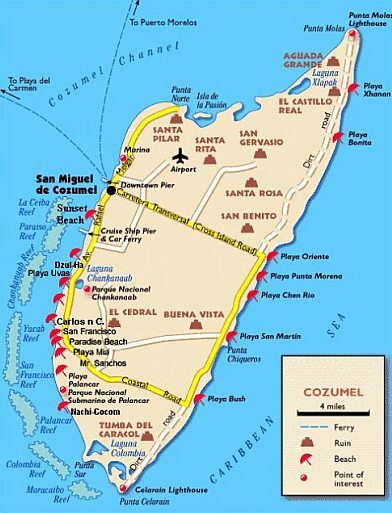 You might find Cozumel island overview page helpful as you plan your trip too. I cover lay of the land, hotels, weather, water temperature, diving, etc. You can find this Cozumel information here. I hope you have a wonderful time in Cozumel. One of my favorite places to dive. Enjoy and safe diving!